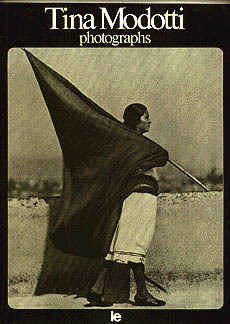 Tina Modotti, born at Udine in 1896, emigrated to San Francisco in 1913. She worked for a short time in a silk-mill and after her marriage to the painter Richey moved to Los Angeles where she associated with cultural circles, and to Hollywood where she acted in commercial films. In 1921 she met Edward Weston, a master of modern photography, becoming his pupil and companion. She went with Weston to Mexico where she developed a style that combined Weston's formal rigour with her personal social and political awareness. In 1927 she became a member of the Mexican Communist Party. She worked in both the artistic and the political field with the avant-garde represented by the union of artists such as Siqueiros, Orozco and Rivera. Unjustly accused of the murder of her lover, the young Cuban revolutionary Julio Antonio Mella and of having taken part in an attempt on the life of the head of state, she was expelled from Mexico. From 1930 until 1937 she lived in Germany, Russia and France. She fought in the Spanish Civil War by the side of Vittorio Vidali with whom she had begun an emotional relationship in Moscow in 1932 that was to last for the rest of her life. Together they succeeded in getting back into Mexico in 1939. She briefly resumed the photographic work that she had abandoned during the harsh years in Europe, collaborating on research into local handicraft, the material of which has unfortunately been lost. She died suddenly in 1942 of a heart attack. The news of her death was received with great emotion throughout Latin America and the recognition of her humane political and artistic personality was immediate.